Yellow jackets. Not that you can see any in the picture, this was a call for a honey bee removal. I’ll give the caller credit for thinking they couldn’t be yellow jackets because they weren’t in the ground and they were in a hollow (sort of) cavity. Sometimes those pesky yellow jackets do things differently. Yellowjacket or Yellow jacket is the common name in North America for predatory social wasps of the genera Vespula and Dolichovespula. Members of these genera are known simply as “wasps” in other English-speaking countries. Most of these are black and yellow like the eastern yellowjacket Vespula maculifrons and the aerial yellowjacket Dolichovespula arenaria; some are black and white like the bald-faced hornet, Dolichovespula maculata. Others may have the abdomen background color red instead of black. They can be identified by their distinctive markings, their occurrence only in colonies, and a characteristic, rapid, side-to-side flight pattern prior to landing. All females are capable of stinging. Yellowjackets are important predators of pest insects. Yellowjackets are sometimes mistakenly called “bees” (as in “meat bees”), given that they are similar in size and sting, but yellowjackets are actually wasps. They may be confused with other wasps, such as hornets and paper wasps. Polistes dominula, a species of paper wasp, is very frequently misidentified as a yellowjacket. A typical yellowjacket worker is about 12 mm (0.5 in) long, with alternating bands on the abdomen; the queen is larger, about 19 mm (0.75 in) long (the different patterns on their abdomens help separate various species). Workers are sometimes confused with honey bees, especially when flying in and out of their nests. Yellowjackets, in contrast to honey bees, have yellow or white markings, are not covered with tan-brown dense hair on their bodies, do not carry pollen, and do not have the flattened hairy hind legs used to carry it. These species have lance-like stingers with small barbs, and typically sting repeatedly, though occasionally a stinger becomes lodged and pulls free of the wasp’s body; the venom, like most bee and wasp venoms, is primarily only dangerous to humans who are allergic or are stung many times. All species have yellow or white on their faces. Their mouthparts are well-developed with strong mandibles for capturing and chewing insects, with probosces for sucking nectar, fruit, and other juices. Yellowjackets build nests in trees, shrubs, or in protected places such as inside man-made structures, or in soil cavities, tree stumps, mouse burrows, etc. They build them from wood fiber they chew into a paper-like pulp. Many other insects exhibit protective mimicry of aggressive, stinging yellowjackets; in addition to numerous bees and wasps (Müllerian mimicry), the list includes some flies, moths, and beetles (Batesian mimicry). Yellowjackets’ closest relatives, the hornets, closely resemble them, but have larger heads, seen especially in the large distance from the eyes to the back of the head. 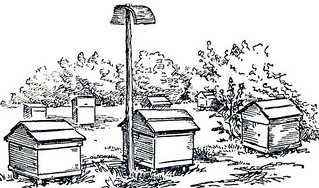 Proverbial bee-keepers’ saying, mid 17th century; meaning that the later in the year it is, the less time there will be for bees to collect nectar and pollen from flowers in bloom in preparation for winter..
We conclude Swarm Week here at Beekeeping365 with an encouragement to set some bait hives in your area. Follow the well published guidelines regarding cavity volume, height, entrance size, and add the odors of drawn comb and another attractant such as lemongrass oil. 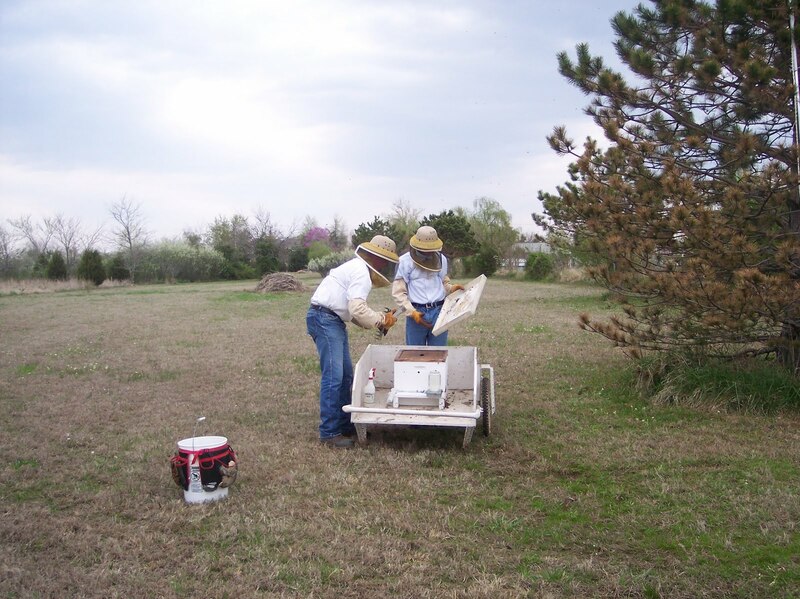 It’s fun – like fishing – except for honey bees! I’m not playing around this year. 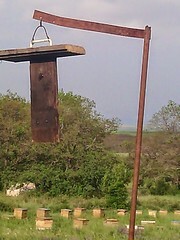 Last year, I was so busy chasing swarm calls, and working, that I got way behind on putting my swarm traps up. I managed to get about 20 traps up, but I got them up late, and only caught 6 swarms in my traps. 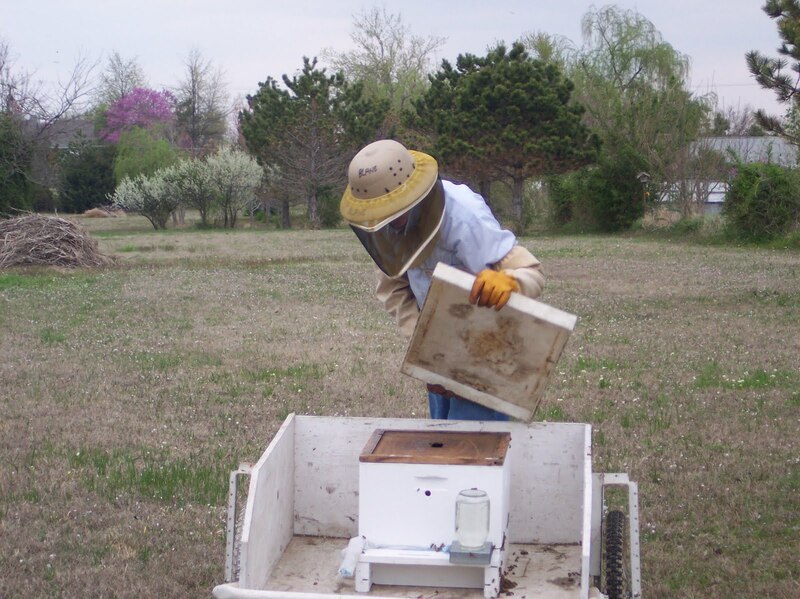 I also used alot of single 5-frame nuc boxes as traps. All of my swarm calls were for swarms over 5 lbs, so none of these would have went into a nuc. A few of them were over 10 lbs and didn’t even fit into a single 10-frame deep. 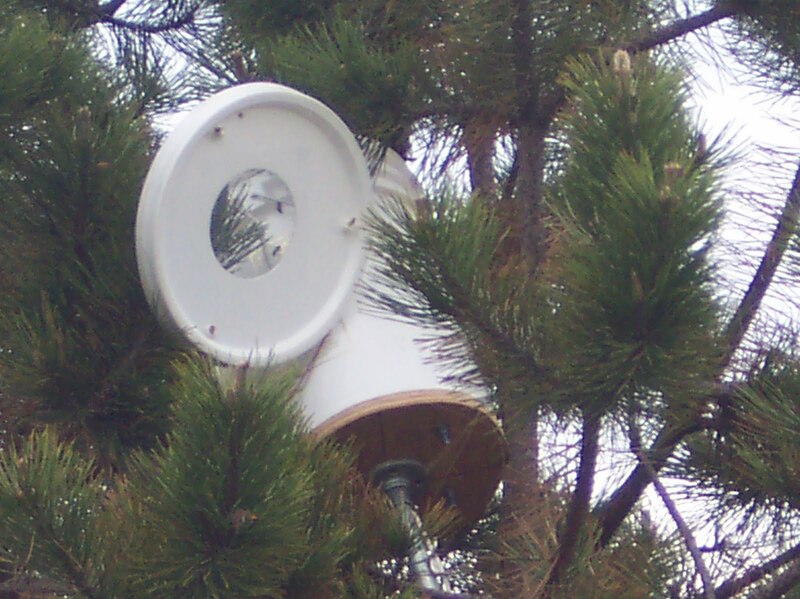 This year, my swarm traps are a minimum of one nuc and one medium. Yesterday (28 March) it was finally warm enough for me to do a hive inspection at the same time that I could take off work. So I inspected Hive A (affectionately knows as Dave’s Bees). The population was very heavy, there was brood in the deep, and in two medium supers. I didn’t see much nectar in the hive, but there was pollen. Unfortunately, the girls got really PO’d part way through and I had to let them calm down. I think that was partly nectar dearth and the fact that it was cloudy and fairly windy. So that inspection was not one where I pulled every single frame. But I didn’t see swarm or superscedure cells, but I did add another medium super to give them some more room. 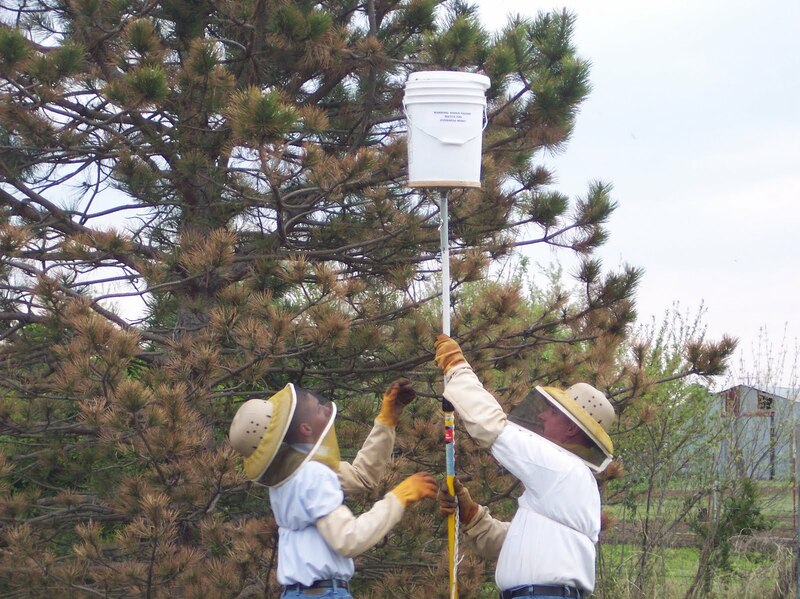 How to Catch A Swarm-N-A-Bucket! 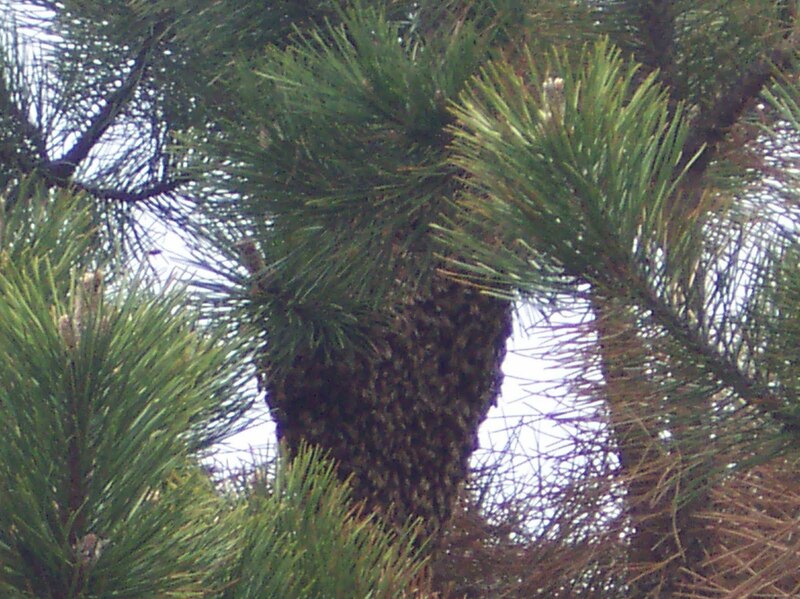 When you see a swarm of bees like this, over 12 feet in a tree, what to do? I’ve lost several very large swarms of Honey Bees, only because they where so high up in a tree (15 to 22 feet), that I had no chance of getting them back. It’s heart breaking to just stand there and look at them, knowing you aren’t going to be able to catch them back. They might stay there for a day or two, but that’s about it. Therefore, I came up with a serious plan for being able to catch them back. If you’ll pay close attention to how we go about this, I’m certain you’ll benefit from these tips. cost is $35. Yes, you can figure out how to make your own if you’d like. I needed one, and quick, so I just bought my bucket. You might need a helping hand in order to get this job done. Bees that have swarmed, are heavy with honey. 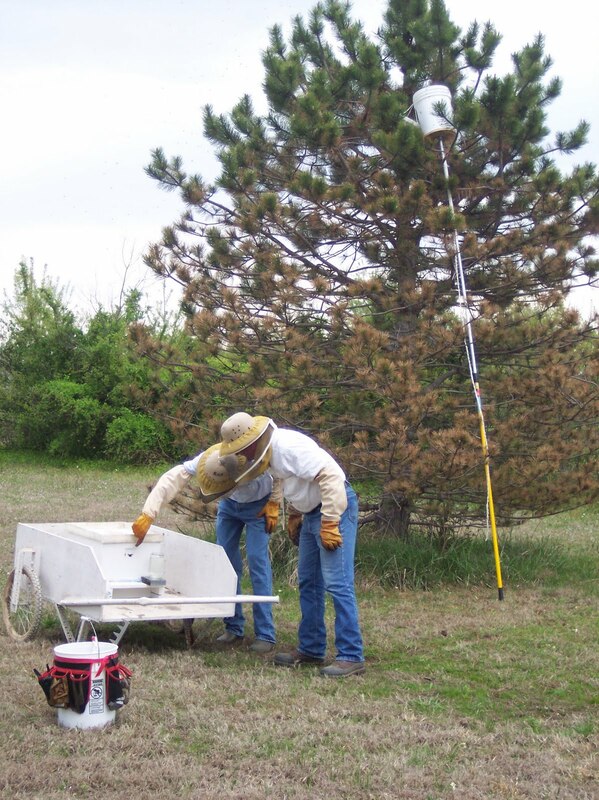 Once the main swarm of bees hits the bottom of the bucket, you can’t just TIP the pole over and dump it into the hive….the aluminum pole will just snap. 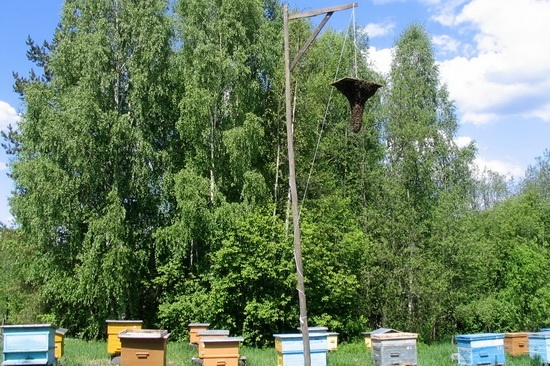 After the bees hit the bottom of the bucket, one person holds the pole upright, while the other person screws the black handle lose, and let the pole slide down into itslef, and THEN you can dump them into a hive. 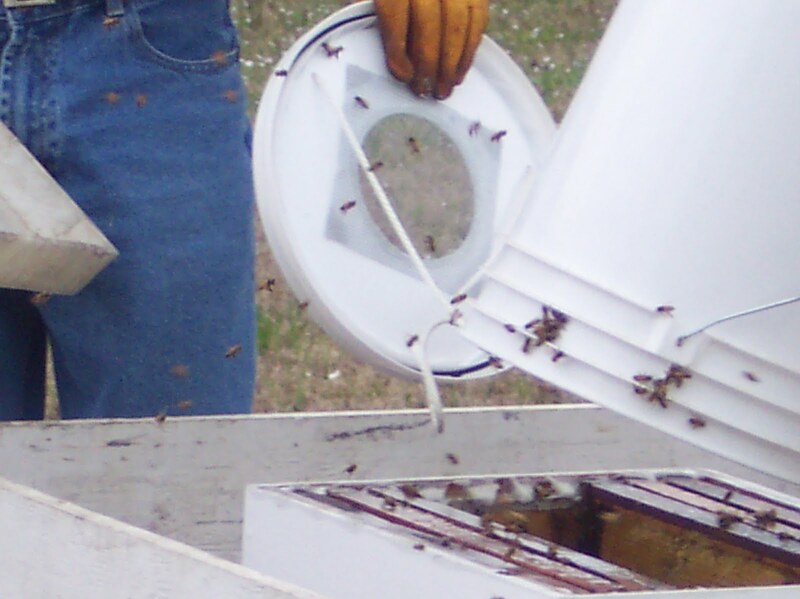 Get the bucket positioned under the swarm and give a solid push. 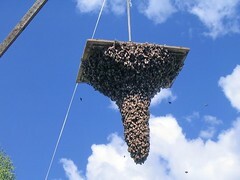 Make certain that the swarm itself is even inside the bucket, before you thump them off the limb. You’ll feel the weight hit the bottom of the bucket, and then it’s up to you and your helper to get the pole upright, and keep it that way. 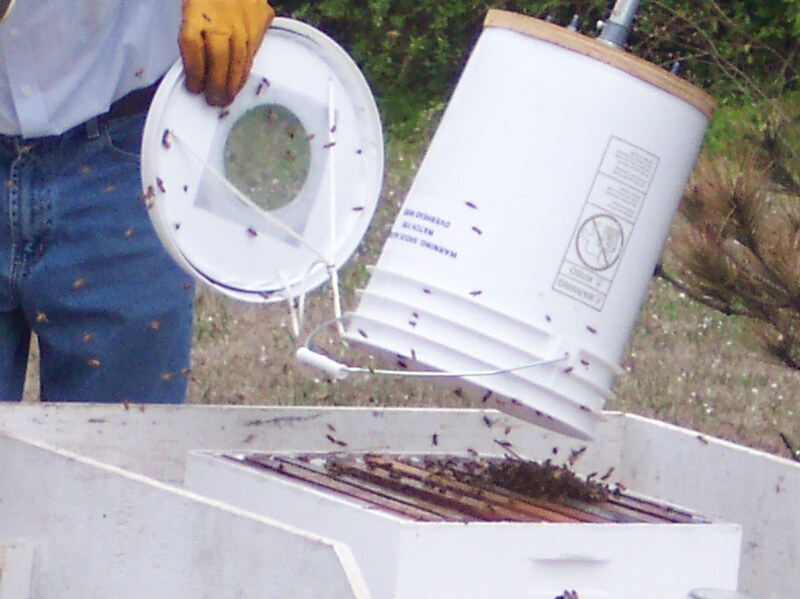 Once the swarm hits the bottom of the bucket, pull the chord hard and close the lid on top of the bucket. 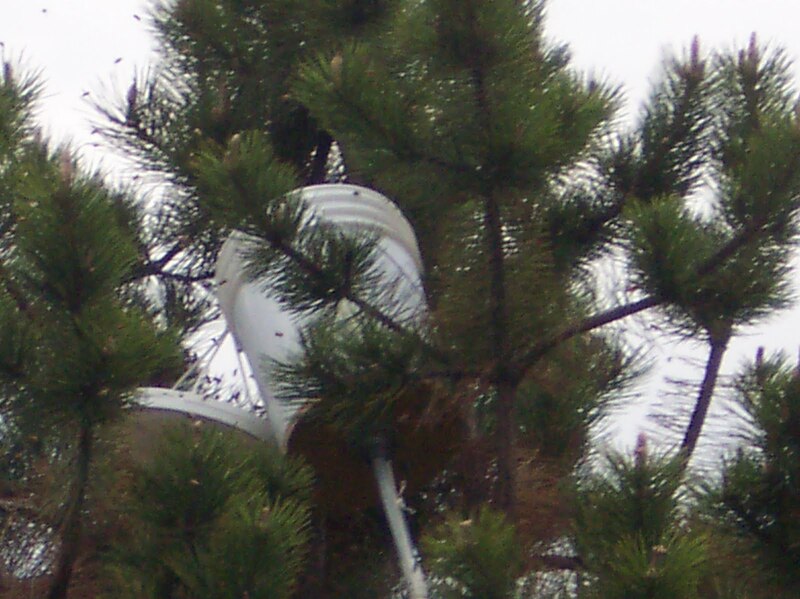 Before I put the bucket up in the tree, I spritz inside with some sugar water. Once the pole is under control, losen the handle and let the bucket come down to a managable level. Then you can walk over and dump them into a hive body. 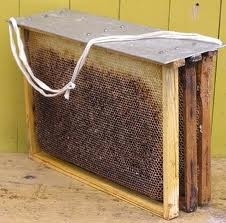 Be sure to take out several frames in order for the bees to have plenty of room to make it into the box. 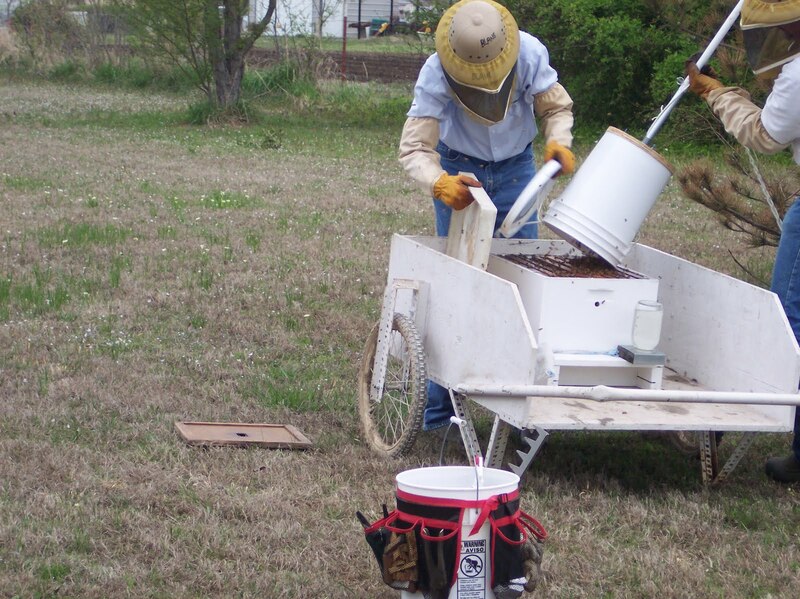 You may even have to go back up with the bucket in order to get another shot at the remainder of the bees. You may do this several times, at least. The point here is; once the initial swarm has been in the bucket, that BEE SMELL from the Queen becomes your “bee lure”. Use it to your advantage. 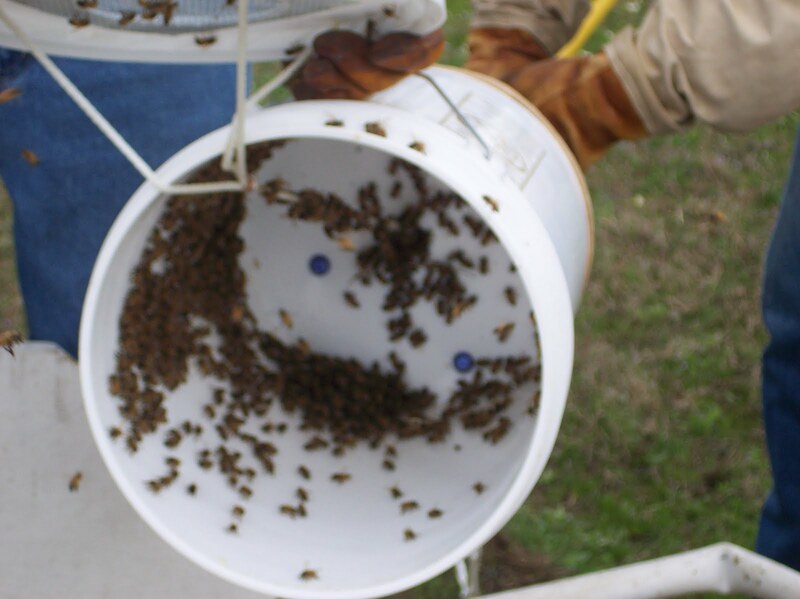 The bees will come down into the bucket in order to find the Queen. You should have gotten the Queen in the first grab. 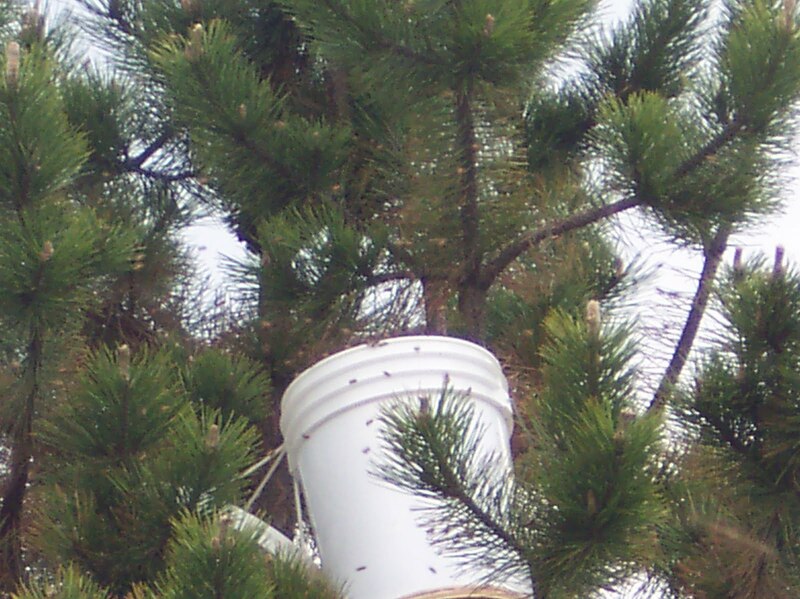 You might even leave the pole and bucket up against the tree for a few minutes, in order to the bees to settle in the bucket. You might even put in a few old, black brood frames if you have some extra. Bees love these black frames! Have your helper take off the hive lid, and dump in more bees. This is repeated about 4 times, or more. Notice on the hive above, the porch entrance is blocked with a towel. I have placed sugar water on them. I left the hole in the box OPEN. Once the bees get oriented inside this box, they’ll start coming out for a look. You can go back up for more bees. Dump them in the box. Each time, you must COLLAPSE the pole. Leave the pole against the tree for a few minutes. 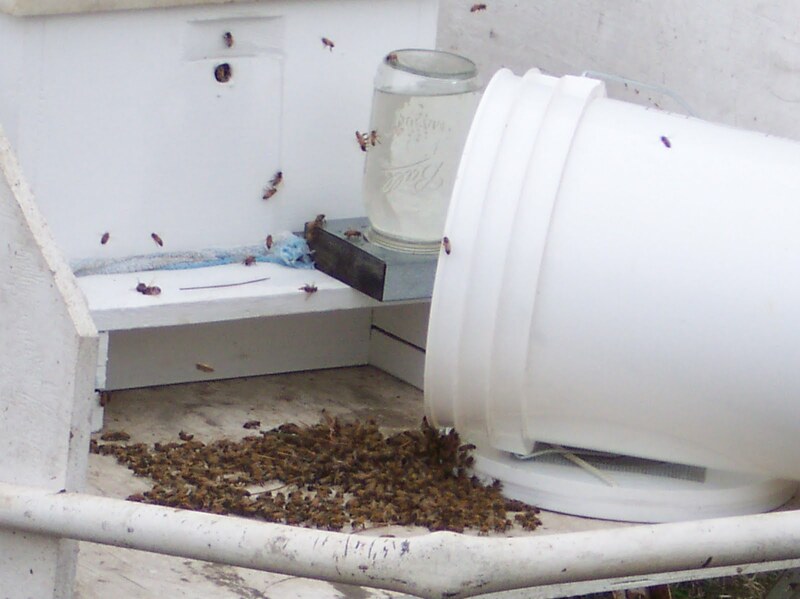 Bees that are flying around, will settle down, and find their way into the bucket to have a look around. You can close the lid again, and bring them down. They’re a bit confused and lost. Help them find their new home! Letting them settle into their new home. Let the bucket lure in more bees. Be patient. Let the smell in the bucket do it’s magic. The bees will look for their Queen BY SMELL. They’ll smell her in the bucket and go down to investigate. 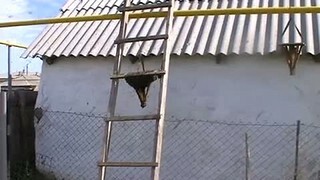 Collapse the pole, bring down more bees. Dump into hive body. Put the lid back on top of the hive body, but upside down…which makes it easier to remove and put back on. We want this lid to stay on while we work the bucket. I want the bees to come back out of the hole, and begin to fan. They’ll “pooch and fan”, telling their sisters to “Come home! Come home! The food is here, and the Queen is here! Come home!” This is what you’re looking for, so watch the bees closely. Once most all of the bees are in the box, put the lid back on properly. Give the hole a squirt of sugar water. Let them get oriented to the front of this box. When you bring your bucket back down, with more bees in it, just set the bucket facing the front of the hive, or tap the bucket off upside down in front of the hive. They’ll quickly figure out where their new home is located. All of these bees got up and made their way into their new home. After about an hour, these bees where all settled down in their new home. 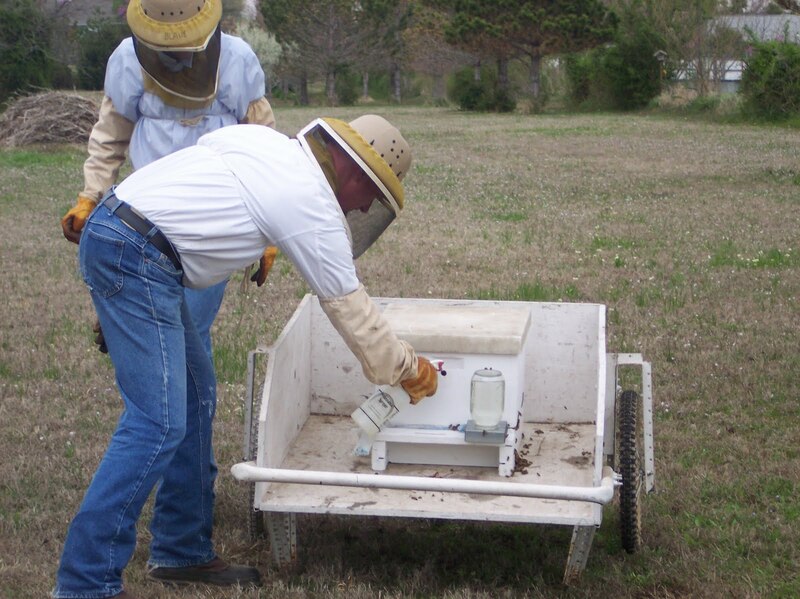 We left the hive in this wagon over night, giving the Scout bees a chance to make it back into their new home also. Later that night, well after sundown, I came out and plugged the hole with Cotton. Early the next morning, I gently moved this wagon to where I wanted to place them on my property. Sadly, within a week, we had a bad cold snap, and temps got well below freezing and we lost all of these bees. I was heart broken, after having done all that work. We fed them properly, but to no avail. They don’t always grab food that is close by. On the flip side, this was our first big catch with our Pole & Bucket system. We learned a lot, and felt much more confident about our abilities to catch HIGH SWARMS. 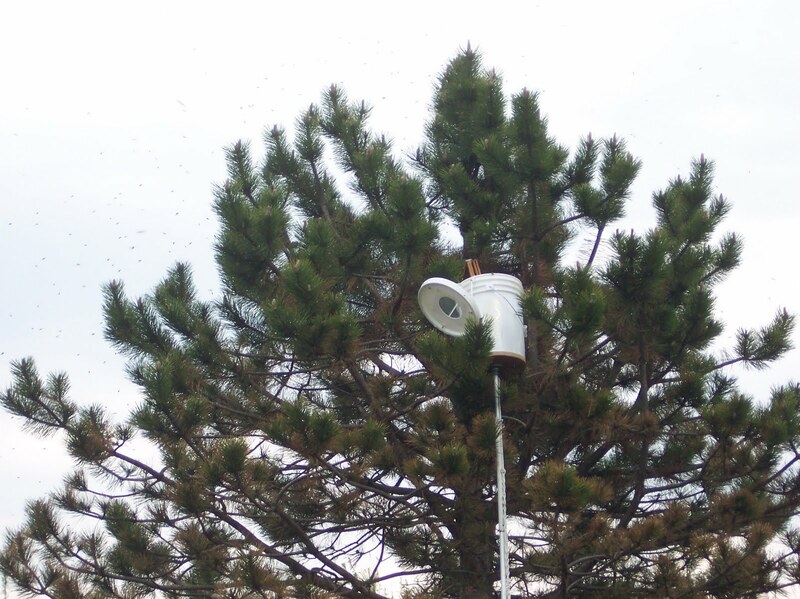 If there are swarms that are over 22 feet up in a tree, we’ll just let them go. By doing so, I populate the surrounding area with “wild bees”, in hopes of a KICK BACK swarm in the next few years. Get you a pole at Atwoods and a make you up a bucket or buy one from Brushy Mountain. You’re sure to need one, if you’re going to keep bees!! Otherwise, you’ll be standing there just like I did for 2 years, wondering what to do. I previously wrote about some potential factors involved in the swarming of honey bees and why swarm prevention and control are so important for the beekeeper. The idea that we can prevent swarms is probably misguided; it is after all what bees are programmed to do, it is how they reproduce, but we must nevertheless educate ourselves and do what little we can in this regard. The people who are most qualified to advise on swarming, or any other honey bee management topic, are the commercial honey farmers who manage thousands of colonies and rely upon their efforts to earn their living from it. This is why I will be quoting from such people extensively here – they have lived and breathed a life with bees and I would rather take heed of their words than those of a keen hobbyist or a well read scholar. Just at closing one day this week, a coworker at the Garden sent an email alerting everyone to a swarm of honeybees just outside the back gate. I was getting ready for programs the next day so wasn’t able to get down there for an hour or so, but finally grabbed the camera and went out to see if I could find it. I asked a couple of people that were standing there talking if they knew the location of the swarm, but they had not seen it. About then, I saw some flying insects, and quickly found a ball of bees about 12 feet up on a small tree trunk. Our swarm season has officially begun here in the Midlands of South Carolina. Beekeepers, old and new, enjoy the thrill of the chase which kicks in the excitement factor associated with gathering a swarm. So what does it take to catch a swarm? I was doing a quick search this morning to determine the ideal swarm catchers equipment list and I was struck by a web page I stumbled upon which detailed the swarm catching of a young sixteen year old making a few bucks while providing a valuable community service during the spring swarm season. What impressed me the most was the young man’s minimalist approach to necessary gear. Basically he had a cardboard office supplies box reinforced with duct tape with a makeshift screen for ventilation on the lid. His second piece of equipment is a plant mister/sprayer with some sugar water. Otherwise he wings it. I have been caught out without any equipment while driving around and responded to a phone call unprepared, yet the property owner and I have found a box, a ladder, and a pruning shear to successfully capture a swarm. Once home it’s easy enough to put them into a proper box. But let’s say you really want to gather a swarm this year and would feel more comfortable having a few items in your car or truck ready to make short work of almost any situation. What items are in the swarm catcher’s essentials bag? Well, probably a standard Langstroth box with frames on a ventilated bottom board. If space in your car or truck is a concern a five frame nucleus box (wooden or cardboard) will suffice. You’ll want to be able to keep them enclosed for the drive back so use some screen or otherwise completely block the entrance. Next is a mister bottle of sugar water to wet the cluster down prior to shaking them or moving to your box. Sugar water isn’t essential but the bees will stay together nicely and it gives them something to occupy themselves with while you work with them. Other items which the homeowner may not have available: ladder, pruning shears or loppers, small handsaw, bee suit, gloves. That’s pretty much all that’s needed to handle most situations. An extra suit is nice if the homeowner wants to get involved. Often they are interested and it’s a good time to do some community education. Here are a couple links if you’re interested in gathering swarms. And also, if you think you’d be interested join one of the online swarm call lists to have your name out there for people in your community to call. Warning: It’s addicting! Checkerboarding is a relatively new approach to swarm prevention. Although it has only been published for about 15 years, it defies the old adage that “swarming is inevitable.” This submittal is intended to substantiate or quantify the advertised reliability. Implementation of the checkerboarding (CB) manipulation is disgustingly simple. 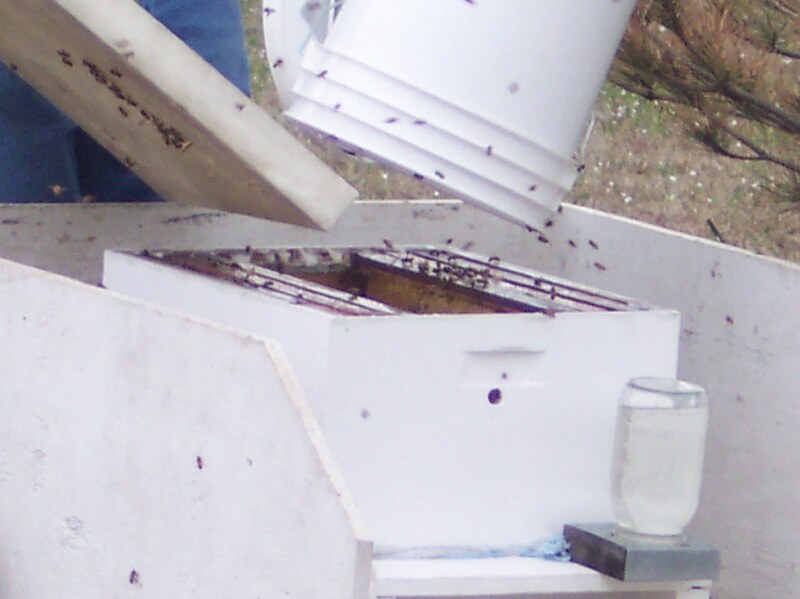 The manipulation consists of removing alternate frames of honey from the top box and replacing those frames with empty comb suitable for rearing brood. Since there is no brood nest disturbance, it can be done in late winter before the brood nest expands into the top box of capped honey. After the initial manipulation, to sustain swarm prevention reliability, maintain empty comb at the top for the colony to grow into with brood nest expansion. If that sounds too simple to be effective, you are in good company. Almost nobody believes it would get the reliability that is inherent in the approach. I know, you really just want another piece of fruitcake and another glass of egg nog. But you also need to start getting ready for swarm season. So while you’re chillin’ inside on this cold day, here’s Jack Lalanne to help you prepare physically for this coming swarm season. If you’re like me, in just a couple months, you’ll be looking in the trees every time you visit the bee yard. I’m not going to get a sore neck this swarm season by walking around looking for swarms everywhere and thinking I hear one anytime I’m outside. What am I going to do? I’m going to get started with Jack Lalanne now! Fast forward to the 40 second mark for swarm fitness! Bubbling over! These bees are overdue for some spring nectar! The Winter Solstice means something different to beekeepers. It’s typically associated with the beginning of winter for humans. But for the bees it’s the beginning of spring. Very slowly, as the days lengthen the queen will begin an increase in the number of eggs she lays. On a colony level, for the bees, the goal is to have a full staff of bees ready to reproduce on a colony level (i.e. swarm) at the beginning of plant nectar and pollen production (best chance of survival). That means preparations such as brood rearing begin during the first months of the new year resulting in hives bubbling over with bees by March. But it has other ramifications for the beekeeper wishing to discourage that workforce from leaving. The beekeeper seeks to 1) encourage brood rearing while 2) protecting the colony from starvation as the bees feed ever increasing numbers of larvae, while 3) discouraging swarm preparations in the same time period. It’s like walking a tightrope! Swarm Season is approaching in the Northern Hemisphere, I can see that interest in the subject is growing from my Stats. In the coming weeks I will be talking about some podcasts I have been on about Bees. They will be posted in chronological order. If you have some time and want to hear about trapping and treatment-free beekeeping give them a listen. In this podcast from 2013 I had been trapping for only a couple years. I can hear the lack of confidence in some of my responses, but others surprised me with how inspired I had already become with trapping and observing the resulting colonies grow and become productive. Several times, Jack questioned as to why I was doing different things. 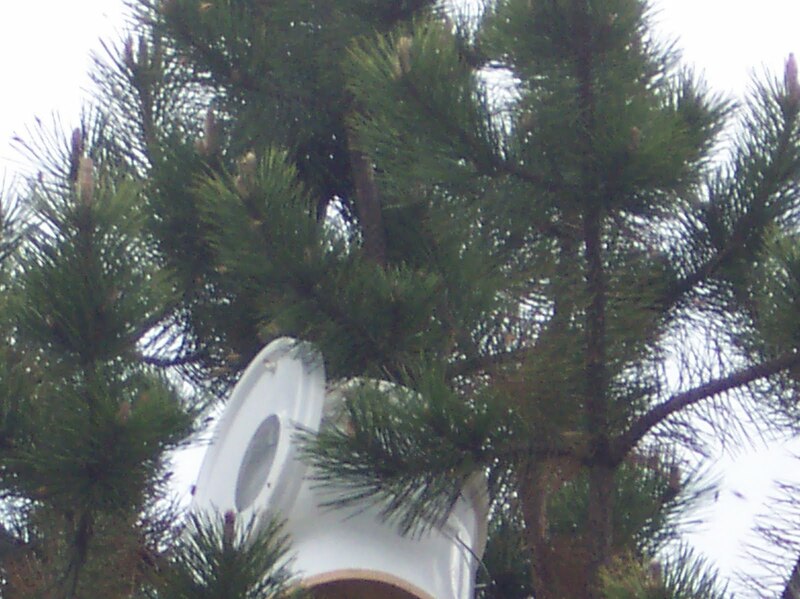 This was was particularly true when asking about placing traps near known bee trees. The reason I was doing it was because I didn’t know what would happen. The experiments I was working on at that time led me to the methods I am currently using. Some of the practices I was using then have changed. Other more productive practices have been picked up through observation. Of specific note in this podcast: I currently recommend you literally place swarm traps, anywhere you can. You never know what’s going to happen. I have been capturing hardy stock at established yards repeatedly now for a couple years. At the time of this recording I had never observed this behavior. 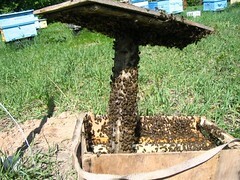 If you have a hive-stand and it’s not full of active colonies there should be a baited hive body setting there. If you find productive lines of bees that overwinter well and swarm back to the hive stand it is a great way to increase your number of colonies. Jack tripped me up a little while discussing trapping in locations with Africanized honeybees. I still have no direct experience with AHB, but feel confident that honeybees can be safely captured where both are living. After trap occupation they should be evaluated for aggression. 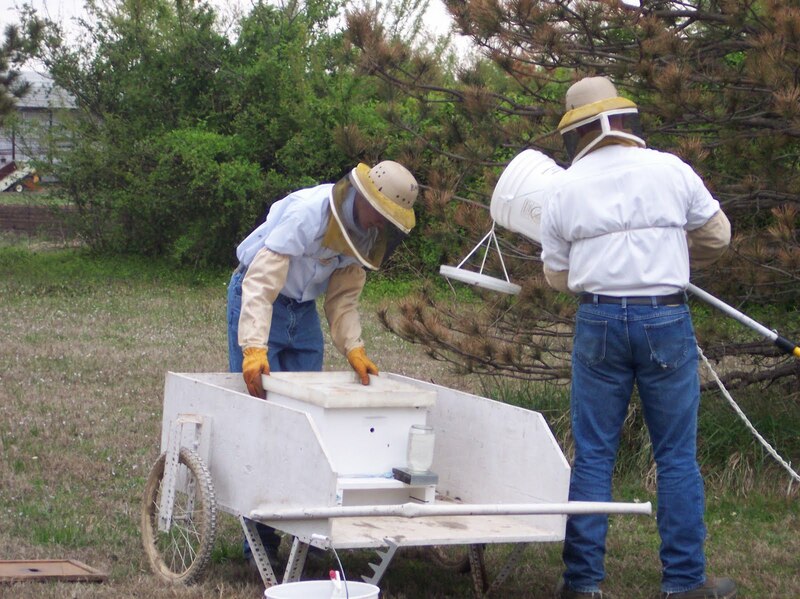 A larger trap volume is theorized to be preferred by European Honeybees. If you live in a location known to have AHB use traps of at least 31 LITERS and make sure they are bee tight. Standard Langstroth deeps are slightly larger than 40 liters and are a great resource as a starting material for swarm traps. I have communicated with hundreds of people trapping bees in AHB areas over the years since this was recorded. 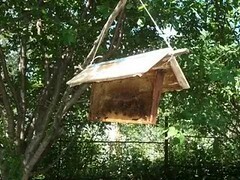 I have received no reports of individuals catching bees in traps that were too aggressive to work. The bees are reported as “hotter” than those typically purchased as packages, but they DON’T DIE. Bees living a feral existence are not bred for docility. I will take bees that require a veil, gloves and smoke to dead bees, so I feel I can tolerate “some” expression of guard behavior. If captured bees display an unacceptable level of aggression a couple avenues are available. Perhaps another beekeeper in your area would be willing to take them. If they have secluded bee yards perhaps they could be left alone to be productive. If they are too aggressive for you or give away they should be SELECTED AGAINST and destroyed. Luckily I’ve never felt the need to do this. I would recommend it be done in the trap using a method that did not use chemicals. When evaluating CATCHES, observe the level of aggression. If they do not meet your criteria they can at least be shut into the trap and disposed of. Then get to catching more bees. Jack’s show, The Survival Podcast is a daily mix of practical knowledge about steps that can be taken to create a stable fulfilling life in today’s world. Many of these seemingly different topics have aided at different times in my beekeepin experience. Jack introduced me to the design science of Permaculture, which led me to Swarm Trapping. Visualizing a dead colony of bees as a resource instead of as a direct loss, and turning a “waste product” into more bees came from reading about Permaculture. I highly recommend the show and think listening to it will make you a better beekeeper. If you listen you will find that it will help your life in general. 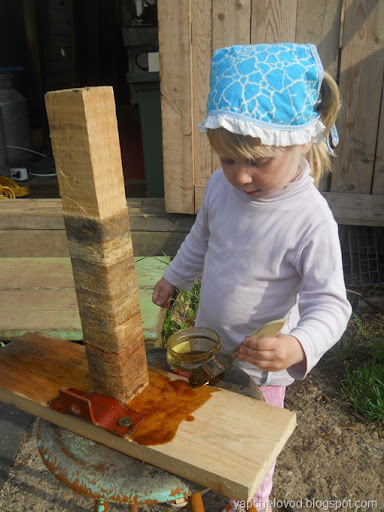 Being self sufficient is at the heart of beekeeping, both for bees and beekeepers. 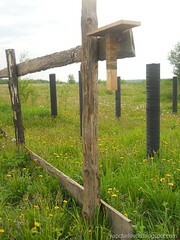 Sourcing through trapping allows for you to obtain local bees by building a simple device. 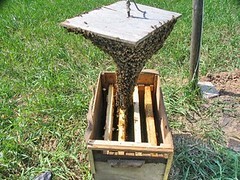 Many swarms can be captured in a single trap over many years with minimal maintenance. Breaking the bond between a colony of bees and a PRICE-TAG makes beekeeping much more fun and easy to justify as a use of your time. Trapping makes you more resilient. You can take the PUNCH of losing colonies and not be OUT of beekeeping. Take the opportunity listen to 1217 and other episodes of the The Survival Podcast. Here is a link to the original posting about this episode from 9/30/2013. Are you getting exciting as Spring approaches?